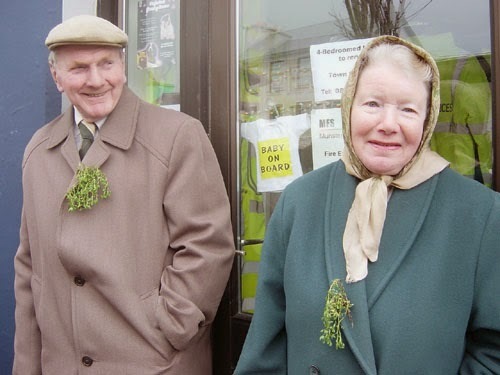 Happy La le fhéile Padraig, an occasion for the “wearing of the Green”. During my childhood I really looked forward to it and particularly the nine am mass at Faithlegg Church. I guess the mass stands out, as in those days before it became a “festival” the day was a much simpler affair. As we didn’t have a car, we went to no parade. But it was a welcome day off from the dread of school, which like so many others we spent out rambling. If unlucky and it rained we hadn’t much option but to sit inside at the black and white telly and watch Darby O Gill and the little people or the Quiet Man re-run. My earliest memory is coming home from school with a hand made badge, a pin stuck on the back with sellotape and a drawing of a harp or St Patrick and plenty of green white and gold. It was always gold, never orange in our home. Apparently the badge originated with Irish soldiers that fought in the trenches of World War I. We could look forward to a break from school, and also a break from lent. Lent in those days to me meant no chocolate, or sweets, or one of my favourites; Tayto crisps. On Patrick’s day, you were given a reprieve. I remember calling to a friends house one day with a bag of crisps and being challenged about my Lenten vow. “The Lord didn’t get a day off when he wandered in the desert for forty days!” When I said it at home later I picked up a new saying; “If you want to be criticised, marry” I later realised she was probably more upset that her husband was slaking his thirst in the West End, with a want spanning from Ash Wednesday. I’ve mentioned before how important church was in our home, and Patrick’s morning was no less an occasion. The main difference of course was the obligatory bit of shamrock, splashed across the left lapel of the coat, and the attachment of it, which had to happen just as we were about to go out the door, in case it would wilt. There were years of course when the shamrock had not been sourced. On those occasions we were dispatched across the strand and up to Nanny’s in the Russianside. Nanny, like many of the older citizens, took a marked pride in the display of the trinity leaf and crucially she had the time to ramble in search of the plant. The ceremony on that day always appealed to me. I enjoyed the stories associated with Patrick, they were more real to me, I could identify with them. 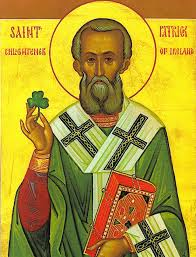 But most of all I loved the singing, and in particular the singing of Hail, Glorious St Patrick. Songs in the church were generally the preserve of Jim “Lofty” Duffin. Jim would stand up in the centre of the congregation and from his hymnbook, sing solo. It didn’t feel right to accompany him, and generally people stayed quite. But there were days during the church year that the congregation shook itself free and one of them was St Patrick’s morning. It’s as if we dropped our reserve on those days, and led off by Jim who was quickly joined by the women, and eventually it seemed by us all. For me, I think the day meant a lot to us as a community in a nationalistic kind of way, a day that celebrated something that made us proud to be Irish in a country that at the time, probably didn’t have a lot to be proud of. And in standing to sing, it was almost like singing the national anthem. For a few short years it was the central meaning of the day for me. After more than forty years, I can hear the singing yet. Here’s the words if you want to sing along. To assist, here’s a beautiful organ accompaniment.